Okay - this thread is for posting your picks for the 2019 BARGAIN BUY competition. Getting in early with this one, was a nice type. NO DUPLICATES in this comp. First to post gets the yearling. MM Lot 920. Shooting To Win - Black Misty $10,000. MM Lot 1001. Wandjina - Intravenous $10,000. I'm a bit of a Shooting to Win fan also. Lot 419 GC MM, Shooting to Win X Bright Heart colt . $ 80K, Thanks Dizzy. All good Carioca, I will just ignore it. 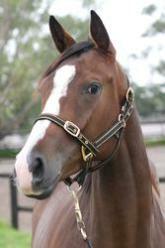 And a reminder to all, no duplicate picks in the comp, first to post gets the yearling. Agree. Beat me to it! Dizzy what's the rule for Pass Ins? Daraabah, passed in lots will be the reserve price. Three-quarter to a stakes winner! Talk, you've a real chance with this one if she's sound. I'll take these 2 thanks. 2 High Chap line stallions and first foals of winning mares from nice enough families. I think TALK already has the Zacinto yearling? Don’t think we can double up?